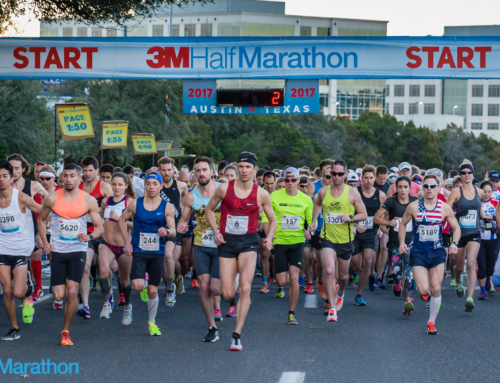 This Sunday will mark the ninth edition of the Gazelle Foundation’s Run for the Water 10-Miler–one of the crown jewels of the Austin Distance Challenge. A record field of 6,000 is expected for this year’s races (including a 5-K and a Kids K) which promises to be the most prestigious and competitive in the race’s history. The second race in the 2015-16 Distance Challenge series, the Run for the Water has the best, most scenic course in Austin as it runs along Lady Bird Lake and Lake Austin. The beautiful out-and-back course, which starts and finishes downtown on the South 1st Street Bridge, certainly isn’t an easy one as it has its fair share of hills, but none of the hills are insurmountable or particularly long. The nearly 3,000 runners in the 10-Mile will begin at 7 a.m. while the 5-K gets underway 15 minutes later. A Kids K will begin at 9 a.m. The long range weather forecast for Sunday morning is seasonal with temps in the low to mid 50s at the race start with scattered clouds. Another deluge has been forecast for Friday and Saturday, but it is expected to clear out by Sunday morning. Keller Williams Realty is once again the active title sponsor which allows the Gazelle Foundation as the race beneficiary to put 100 percent of all race proceeds to water system projects in Burundi—the home country of Gilbert Tuhabonye. Proceeds from this year’s race will help fund nine new water projects to be built in 2016. Overall, due to the success of this race and its fund raising, the water projects have had a profound impact on 50,000-plus Burundians in rural areas who now have access to clean and safe drinking water. In addition, individual fundraisers have already raised $48,000 for this year’s race with top Masters runner Ivi Kerrigan leading the pack. Starting on the South 1st Street Bridge, the course heads west on Cesar Chavez and Lake Austin Boulevard. Near the Hula Hut along Lake Austin (approximately the 3-mile mark), the course makes the climb up the very familiar Scenic Loop to about the 5-mile mark. This 2-mile up-and-down is the toughest part of the course, but once the top of Scenic has been reached, the real fun begins. The course barrels downhill on Pecos for 1 ½ miles to Enfield with the seventh mile marker right at the corner of Enfield and Exposition. After a very short climb on Expo comes a sweet downhill back toward the lake and then heads back on Lake Austin and Cesar Chavez for the final two miles back to the finish on the 1st Street Bridge. For the fourth year in a row, the Run for the Water will serve as the RRCA Southern Regional 10-Mile Championships so expect plenty of the top regional runners in the open, masters, senior masters (50+) and senior grand masters (60+) divisions. The competition at the front should be fairly fierce, but neither three-time defending champion David Fuentes or two-time champ Tia Martinez is running. Fuentes is in New York City for the marathon, working the expo and Martinez just had her second child and is living in Oklahoma. Some of the top local entrants include Bryan Morton, triboy Scott Kimbell, Jeff Sadler, Joe McCelleon, Alex Moore and Collin Smith who was third last year. The top women should include Jennifer Harney, Mary Goldkamp, Cate Barrett and masters runner Cassie Henkiel. The course records are 48:49 by Scott MacPherson in 2011 and 55:30 by Martinez, set in 2013. Packet pick up and registration for the Run for the Water begins Thursday (noon-6:30) and continues on Friday (10:30-6:30) and Saturday (9:30-5:30) at Luke’s Locker (115 Sandra Muraida). There is race day packet pick up but it’s only for out-of-towners. That begins at 5 a.m. at the race start/finish area on South 1st. There is plenty of free parking available downtown as well as at several nearby paid parking garages such as One Texas Center and t he Long Center/Palmer Auditorium. One of the highlights of the Run for the Water used to be the Burundi national anthem as part of the pre-race ceremony. Although Gilbert Tuhabonye and Bernard Manirakiza won’t be singing this year, they’ve made up for it by adding a group of Burundian drummers at the finish line. For more info, go to runforthewater.com.